Hong Kong: Apple’s new iPhone 4S made glitzy and chaotic debuts in three new Asian markets on Friday, with customers and profiteers queuing for up to a week to get their hands on the popular gadget. Thousands of people thronged Apple’s new harbourside store in the southern Chinese city of Hong Kong as staff cheered and clapped, while midnight launches in South Korea and New Zealand featured celebrities and sports stars. Top South Korean mobile operator SK Telecom put the iPhone 4S on sale at midnight for 100 enthusiasts who had placed pre-orders, with the country’s most popular actor Wonbin and actress Shin Min-A counting down to the time. Hip-hop musicians performed at the event at the company’s headquarters. 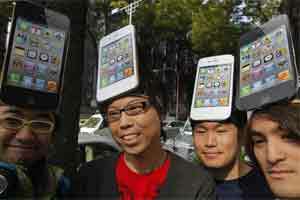 Die-hard fans had been keenly awaiting an upgrade to the earlier iPhone 4 long before the 4S was unveiled on 4 October. “I’ve been waiting for the iPhone4S for over an year, and I didn’t hesitate when I heard the news that it will be sold in Korea," said Lee Jae-Kwang, 31, the first in line for the phone at SK Telecom. The latest version of Apple’s “must-have" accessory was due to roll out in 12 other markets from Europe to Latin America later in the day. The celebratory atmosphere was soured in Hong Kong by the presence of dozens of aggressive profiteers and professional queuers who established a grey market outside the store almost as soon as the phones went on sale at 7:00 am. “I have collected about 198 phones since this morning from my queuers," said mobile phone dealer Ken Wong, adding he paid the queuers around US$70 each for their efforts. He said the phones were for his “friends and customers". “The response on the iPhone 4S has been overwhelming," he added. Regular customer Xu Yaojun came from Xiamen in China with his wife and eight-year-old daughter, who skipped school for the occasion. He arrived at 10:00 am but staff told him there were only enough phones in stock for people who had waited in the queue, which was about 1,500-strong when the store opened its doors. “The staff told me the phones are all sold out... I can’t wait for the official release in (mainland) China, that’s why I’m here," the 33-year-old businessman said. He said he would have to pay extra to buy an iPhone 4S on the grey market. The launch was more laid back in New Zealand, where about 100 people showed up for the midnight launch in Auckland. Telecom Corp. laid on pizza and entertainment, and All Black rugby star Dan Carter manned the sales desk. The iPhone 4S is already a record-breaker for an Apple product, with more than a million sales in the first 24 hours of pre-orders when it first went on sale last month, shortly after the death of Apple co-founder Steve Jobs. The latest in the iPhone series boasts faster speeds, a voice-controlled assistant called Siri and an improved camera. New Zealander Jonathan Mosen, who is blind, queued for six hours to ensure he got his hands on the phone, saying its voice recognition technology was a boon for the visually impaired. “It’s the only cellphone you can take out of the box and it is usable by a blind person," he told Fairfax Media. Apple plans to make the iPhone 4S available in more than 70 countries by the end of the year. The buyer frenzy comes despite software bugs that have caused some iPhone 4S owners to report lower than expected battery life, and reports that the Siri software may not cope well with foreign accents.